Im back i guess with a new wall which is the official Japanese box art for the new Kingdom hearts 2 game which is coming next year . I got the image from my little brother and from what he says its 80 hours of gameplay and 35 hours of fast gameplay without the collectiing and power ups... and Hell there is a lot on the game like Tron, Pirates of the Carribean, 50's Mickey mouse, Mulan, Lion King and Final fantasy 7, 8, 9, 10. Ummm i wanted to keep it simple and all, kept the original title on there, added some cloud effects and texture effects to bablance the whole wall... then put the poem text which will describe the whole story like in the Kingdom hearts 1 version. Nothing much to say but its a boundful effort of out most proportions but yeah overall its a good job i did to give some hope for Kingdom hearts. In my opinion it looks like poster, but it doesn't mean I don't like it. Nice scan you choose for it, and in total it looks great. Thanks for sharing. I can't wait for the game! I really like the picture, great job! Characters look awesome, can't wait to get my hands on this game. Nice job putting this one together. The characters look greaton the center. Damn I wub the image. Really nice job on the bg. It looks empty but the image is standing out greatly as wanted. Superb text work as always. Hey there, great job on the wallpaper. I like it love the scan and the characters look really cool! Ilove the background too it makes it look awsome amazing work! Wow... the texture reminds me of something... vintage t-shirt! Yes! Aw... if only I could wear my laptop around my neck! +fav >3 thanks for sharing! Hey Oracle glad to see and hear about Kingdom Hearts 2. Nice simplistic wall that's all I can say. Plus I've MIA for quite a while but I'll be back with a least a new wall next year. this one is a very good wall, I personally liked the main chara in the middle, their stance is cool, and this wall is very clean (which I like most in walls). 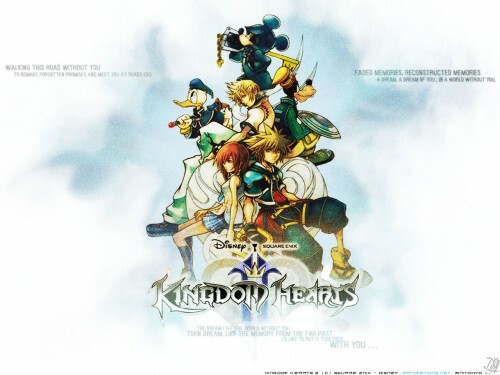 Actually, I liked kingdom hearts too, but I never played much, just watched my brother play... hehe, I not a very good player in this kind of game, I prefer the turn battles in FF. Anyway, this one is cool for it's "simpleness" and the clean and neat image of the final image! Ohh, I can't wait to play this game. *geek* XD Anyway, like you said, nice and simple. Great way to get hyped for the game. ooOOOo nice wall. i like that image definetly. but i'll have to agree with a comment somone has made about it looking like a poster or cd cover lol. but its still nice.